This fabric is 60″ wide (150cm) as opposed to the standard 45″ (115cm) roll. 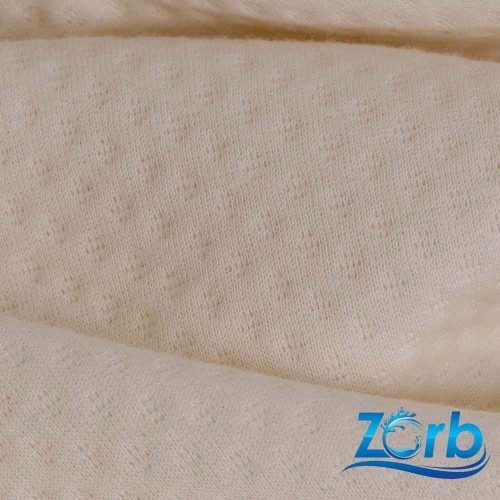 2nd Generation super-absorbent hypoallergenic fabric that can be used on its own, not as an interlining so it’s ideal for reducing cost, increasing product performance and supporting the environment. Unique, three-dimensional engineered dimple pattern provides greater retention, superior hold, faster distribution of moisture and less leaking under compression. Reversible fabric contains thirsty Zorb® fibres between a face and back of absorbent bamboo and organic cotton. Perfect for soakers, changing pads, cloth menstrual pads and incontinence products. 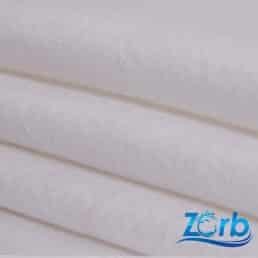 A single layer will replace 6 layers of terry towelling or 3 layers of microfibre terry. Approx 18%-20% (length) and 2%-4% (width). Calculate shrink and add this as an allowance in your pattern. Serging Zorb II requires well tuned machines and moderate serging experience. If you find the material is not getting serged cleanly (material pulling into knives) your serger may need tuning. Sewing with dull or poorly setup knives will stretch and break yarns to the left of the needles which will appear as pinholes after a few washes. Zorb II dimple pattern is a lot easier to serge than Zorb II diamond.